I don't go to as many conferences as I used to, but the advantage of that is that I have time to go to ones that take my fancy. 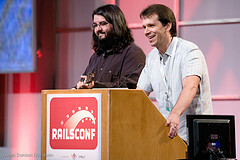 I've long had a particular fondness for the Ruby community, so I turned up as an attendee at this year's RailsConf. With a young technology there's lots of new and important pieces appearing, but for me the most important of these is JRuby. Now in its final cycle of release candidates, JRuby offers a full implementation of the Ruby Platform on the Java JVM, as well as providing a scripting language for the JVM. For what we do at ThoughtWorks, and for many Ruby/Rails developers this matters a great deal even if you never "include java". Chad Fowler and Rich Kilmer introduced the conference. Chad shares my name but I don't share his ukulele skills. One of the biggest issues our Ruby teams run into is deployment. Getting a ruby app into production involves a whole bunch of new technologies, and data centers tend to be conservative on this kind of thing. Our RubyWorks stack tries to simplify this, but JRuby offers the choice of just deploying into a Java container, turning a Rails app into an easily deployed war file. I think this will make Ruby on Rails a much more viable choice in lots of enterprise environments. JRuby's maturity on the JDK raised the obvious question of what will happen with the other popular managed runtime. Signals from Microsoft were faint and unclear. It was good to see notable Microsoft-oriented geeks Scott Hanselman and Chris Sells at the show, even if when I saw Chris Sells it felt like being in an arena. What I like is that there is a real desire within the ruby community to collaborate with Microsoft rather than the usual competition and Redmond-bashing. 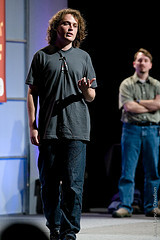 Indeed the overwhelming impression I got at RailsConf was a sense of industry-changing mission. At last year's conference my sense was that of a community delighted and rather stunned by its success. My iconic image was DHH as Neo of the Matrix, breaking the rules of enterprise software and reveling in the success. This year my sense is that this morphed into something much more important. Success is not just being an outbreak of sanity in the IT world, but actually leading that world. There seems an excellent chance that Ruby and Rails could become a significant platform for IT develop over the next few years. We're already seeing signs of this at ThoughtWorks - 40% of our new business this year in the US is Ruby work. Unlike previous platforms, this one isn't controlled or even dominated by vendors. Ruby is a community effort. I've been hoping for a long time that one of the LAMP technologies would break through into corporate IT, and it looks like Ruby could well do it. My hope that with a platform that's controlled by a community we'll see a platform that focuses on simplicity - finding the key things that need to be done and doing them in a way enables programmers to provide their best. Michael Koziarski and Jamis Buck describing the Rails Way - establishing the good style which lies deep in the Ruby community. It's helped by the fact that the ruby community has formed around the best ideas of the OO and Extreme Programming communities. Listening to the keynote of Jamis Buck and Michael Koziarski I was delighted to reflect on the thought that they were right there in the values of Ward, Kent, and all the other people who've been advocating clean code, well-factored object-oriented design, and testability. These ideas have made a great impact on many other technological communities, but in Ruby-land they are the orthodoxy. Throughout the conference there was a sense that we are at an inflection-point in our industry, a key technological shift that promotes a new major platform. Listening and reading about JavaOne I got the sense that a big shift had happened there, people no longer focusing on Java the language but on Java the JVM, replacing one language with multiple languages closely collaborating. A particularly fascinating thing about the Ruby community is the diversity of ages of people in it. Not just do you have the young paradigm breakers like DHH and the core team, you also have the, ahem, rather more seasoned campaigners like PragDave and the RubyCentral triumvirate. The important thing is that there's a lot of respect and collaboration across this generation gap. There isn't the wall between the old farts and the loud teenagers that you often get, instead a real appreciation for what both groups have to offer. Not that all is good, however. There is a marked lack of women in the ruby community which, apart from the fact that we're missing out on some serious talent, probably is a sign of other problems within the community. The DevChix group was pretty active in looking for ways to try to correct this and I was pleased to see several conversations sprout up during the conference on finding ways to improve our Diversity problems. A couple of years ago I wrote about the impressions people had that the RubyPeople were notably more friendly than most software communities. Talking to people at RailsConf I got the message that that had changed for the worse. Both the ruby lists and particularly the rails lists had tended more towards the sad Internet mean. In his opening keynote Chad Fowler said that the rails community had a reputation as "a bunch of arrogant bastards" and I cringed as an, admittedly small, group raised a triumphant cheer. What pleased me was, that starting with Chad, there was a strong push from the ruby leadership to try and change this. A theme that came from several talks was that our community had an opportunity to try to lead the software profession away from this tar-pit of NetNastiness and lack of diversity, to create a community that really welcomed many types of people into a nurturing and pleasant environment. I've been sick of the tone of geek discussion for many years and if the Ruby community could really show a direction to lift us out of this quagmire, this would delight me even more than all of the other prizes that glitter in front of us.